Cell differentiation is a widely studied phenomenon forming the basis of all developmental processes including fetal growth and bone fracture healing. A series of recent studies indicates the emerging role of chondrocyte-to-osteoblast transdifferentiation during bone tissue formation, known as endochondral ossification (replacing cartilage with bone). 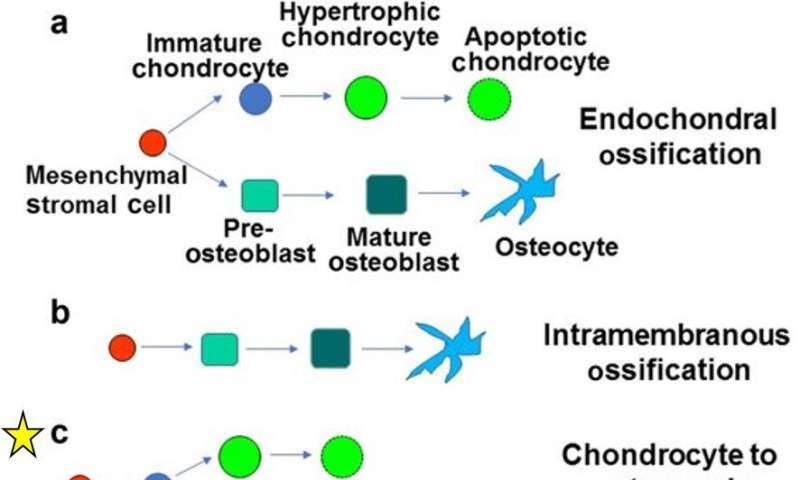 While transdifferentiation is not a new phenomenon and occurs when mature cells switch from one differentiated phenotype to another, new data have identified three models for chondrocyte (cartilage) to osteoblast (bone) transdifferentiation during fracture healing. Now writing in Bone Research, Patrick Aghajanian and Subburaman Mohan have dissected the three emerging models and categorized them to better understand the process of bone building. The new knowledge will allow bioengineers in regenerative medicine to advance the molecular basis of bone repair. During typical cell differentiation, programmed cells progress along a specific lineage until they reach an endpoint of terminal differentiation and apoptosis. Transdifferentiation does not follow the preprogrammed path, switching instead from one mature phenotype to another. Prior to assessing the newly discovered mechanisms of chondrocyte-to-osteoblast transdifferentiation, the authors first reviewed the traditional mechanism of endochondral ossification. The typical process of replacing cartilage with bone is divided into primary and secondary pathways, beginning with a template of rapidly proliferating immature chondrocytes that secrete a collagen matrix. In the primary process, chondrocytes undergo differentiation to form the bone matrix, facilitate bone forming cells (mesenchymal stromal cells) to enter the process and differentiate into osteoblasts/osteocytes during embryogenesis, while the chondrocytes themselves become hypertrophic to undergo apoptosis. The secondary process occurs similarly but post-natally, during which immature chondrocytes become hypertrophic and undergo apoptosis, and the vasculature invades to transport marrow, mesenchymal stem cells and osteoclast precursors to initiate bone formation at the center and extend peripherally. 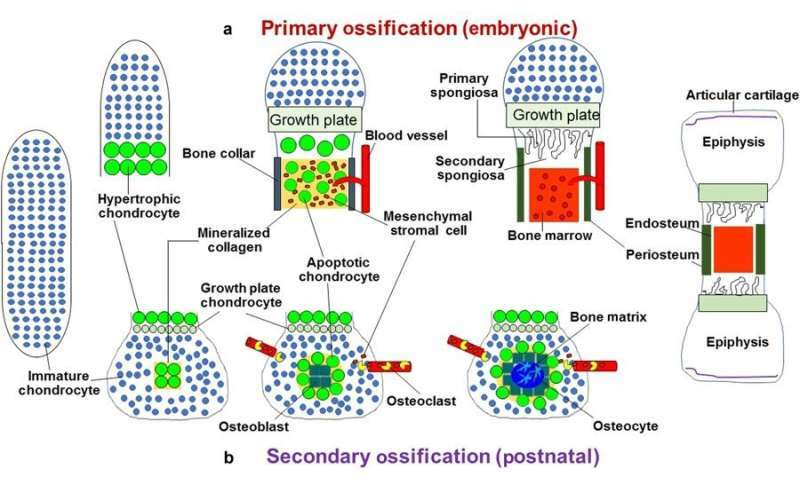 Models of bone formation a) endochondral ossification – mesenchymal stem cells develop into two different lineages; chondrogenic or osteogenic without intermediates, b) intramembranous ossification – osteoblast development without the formation of a chondrocyte template: mesenchymal stem cells directly differentiate into an osteogenic lineage, c) chondrocyte to osteogenic precursor – immature chondrocytes differentiate into an osteogenic precursor population that differentiate into pre-osteoblasts and osteoblasts, d) de-differentiation to redifferentiation – hypertrophic chondrocytes dedifferentiate into immature chondrocytes that directly differentiate into an osteogenic fate, e) direct transdifferentiation – hypertrophic chondrocytes directly differentiate into osteoblasts. The starred mechanisms indicate the three pathways of transdifferentiation. Credit: Bone Research, doi: 10.1038/s41413-018-0021-z. Endochondral ossification – a canonical pathway; mesenchymal stem cells differentiate to chondrogenic, adipogenic or osteogenic cells for subsequent terminal differentiation during bone formation. Intramembranous ossification—also plays an important role during canonical bone formation (forming flat bones in the skull, mandible and clavicle), the differentiating mesenchymal stem cells directly form the periosteum. Chondrocyte to osteogenic precursor model – a mechanism that generates both stem cells and osteoblasts during rapid bone growth. The model appears to be specific to metaphyseal (narrow portion of a long bone) growth, which occurs embryonically during primary ossification for most parts, but can extend into post-natal growth. 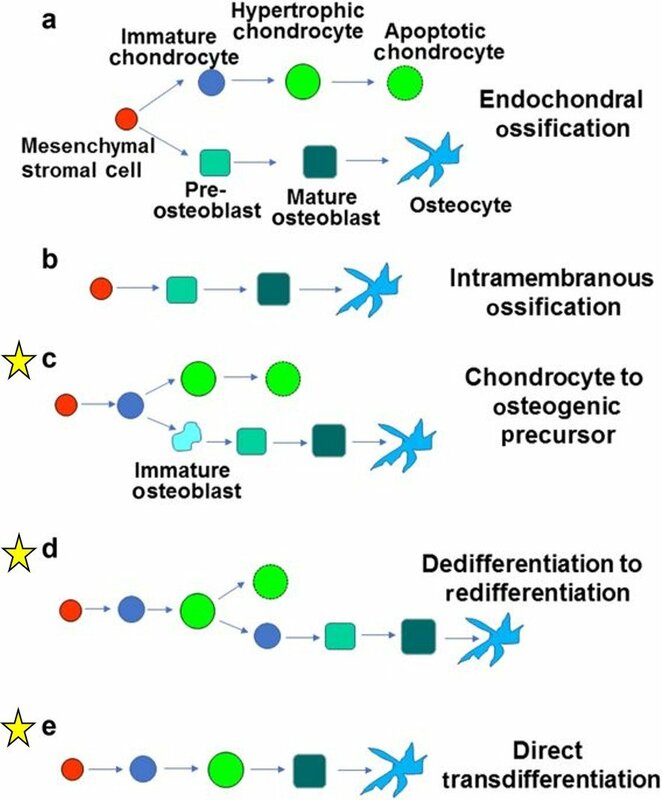 Dedifferentiation to redifferentiation—an alternative view of chondro-osteogenic transdifferentiation, where chondrocytes undergo hypertrophy to either enter apoptosis or dedifferentiate into osteoblasts and further into osteocytes. The model occurs during embryonic and postnatal development, as well as during fracture healing, supported by studies, while open for further experimental interpretation to validate the mechanism. 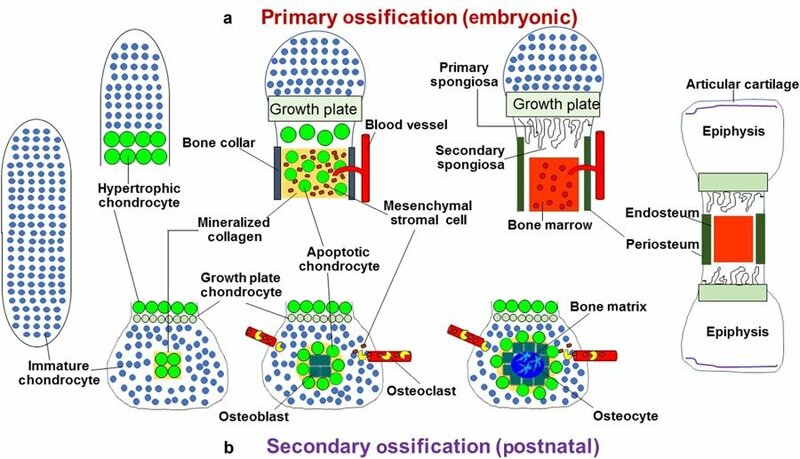 Direct transdifferentiation – a method by which postnatal secondary ossification occurs: chondrocytes mature and become hypertrophic, but do not enter apoptosis, instead differentiate directly into osteoblasts and osteocytes. The models are supported by experimental studies both in vitro and in vivo. While the exact cause for chondrocyte to osteoblast transdifferentiation is unknown, regulatory factors are necessary for that transition. Runx2 gene, for instance, is a master regulator of osteogenic fate, capable of transdifferentiating adipocytes, primary skeletal myoblasts, odontoblasts and vascular smooth muscle cells to osteogenic cell types. Studies with animal models are required to validate the contribution of various signaling pathways identified in in vitro studies during chondrocyte-to-osteoblast transdifferentiation. Current therapies for non-union fraction involve mesenchymal stem cells derived from patients to promote direct bone formation at the site of fracture, but these strategies are not effective and may be cost-prohibitive. Molecular events that directly convert chondrocytes to osteoblasts can potentially lead to novel therapeutic strategies to heal non-union fractures. New strategies can be developed to manipulate signals that control chondrocytes to osteoblast transdifferentiation during osteochondral ossification for therapeutic benefit in the treatment of joint injury and disease. If, as predicted, chondrocytes contribute an important source of osteoblasts and other bone formation processes during bone growth, then studying the mechanisms of transdifferentiation will provide exciting new strategies to develop anabolic therapies for bone wasting diseases such as osteoporosis. Innovative experimental studies in the future could probe the contribution of chondrogenic tissue to new bone, with significant potential for new avenues of therapeutics in bone tissue engineering, to promote fracture healing and decline the progress of various osteogenic diseases. Research on chondrocyte-to-osteoblast transdifferentiation is still at an early stage and could potentially resolve several unresolved and conflicting questions in bone research. More information: Apoptosis the sculptor of development www.liebertpub.com/doi/abs/10.1089/scd.2004.13.473 Andrea Doseff, 2004, Stem Cells and Development. Dedifferentiation, redifferentiation, and transdifferentiation of striated muscles during regeneration and development www.ncbi.nlm.nih.gov/pubmed/26970627?dopt=Abstract Manfred Frasch, 2016 Curr Top Dev Biol. Developmental regulation of the growth plate www.nature.com/articles/nature01657 Henry Kronenberg, 2003, Nature. 9. Fate of growth plate hypertrophic chondrocytes: death or lineage extension? www.ncbi.nlm.nih.gov/pubmed/25714187?dopt=Abstract Tsang et al, 2015, Dev Growth Differ. WNT/beta-catenin signaling promotes VSMCs to osteogenic transdifferentiation and calcification through directly modulating Runx2 gene expression. www.ncbi.nlm.nih.gov/pubmed/27321958?dopt=Abstract Cai et al, 2016 Exp. Cell Res. Ihh and Runx2/Runx3 signaling interact to coordinate early chondrogenesis: a mouse model. www.ncbi.nlm.nih.gov/pubmed/23383321?dopt=Abstract Kim et al, 2013, PLoS One.